It will consider powering oil and gas platforms with clean energy, sharing infrastructure with offshore wind farms and producing hydrogen as a ‘clean-energy storage solution’. The body will also examine the possibility of creating North Sea power hubs combining electricity and hydrogen production from wind, it stated. It hopes closer links with the renewable sector could help support the energy transition as well as maximise the economic recovery of UK oil and gas, the authority stated. OGA will work alongside the UK’s department of business, energy and industrial strategy, seabed landlord The Crown Estate, and energy regulator Ofgem to explore potential synergies between the oil and gas and renewables sectors. The Better Regulation Executive, a governmental body tasked with helping bring innovative products and services to market, awarded the OGA a £900,000 (€1 million) grant for the project. OGA will publish a policy position on its role in the energy transition in spring 2019, while its exploration of potential synergies with the renewables sector will last until spring 2020. "This is a really exciting opportunity to advance the energy transition agenda, looking at practical steps that can be taken and how we as regulators can support that," said Andy Samuel, chief executive of OGA. Windpower Monthly has contacted clean energy lobbying groups RenewableUK and the Offshore Wind Industry Council for comment. In August, Norway’s state-owned energy company Equinor has proposed Hywind Tampen, an 88MW floating offshore wind farm, could power platforms at its Snorre and Gullfaks fields in the Norwegian North Sea. OGA is also not the first energy body to consider a hub in the North Sea connecting offshore power installations. 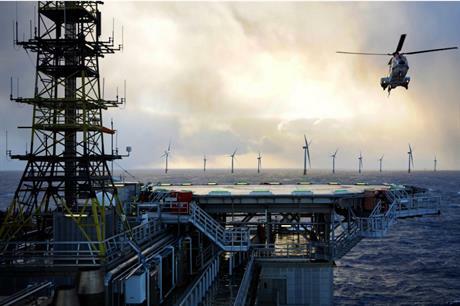 Transmission system operators Tennet and Energinet and gas infrastructure company Gasunie are investigating the potential for a North Sea power hub capable of connecting more than 100GW of offshore wind between 2030 and 2050.